The global wearable sensors market is set to reach USD 4.0 billion by 2024, witnessing a CAGR of 32.4% during the forecast period. Increasing the advancement of wearable sensing, wireless communication techniques, high performing processing systems and low consumption of energy are the major factors that are bolstering the growth of the global wearable sensors market. Wearable sensors are helping the users in monitoring blood pressure, heartbreak, respiratory rate and fever along with falling, drowning and sleeping. Moreover, the growth of wearable sensors market is exaggerating due to increasing demand of wearable sensors among working woman in various developed as well as developing economies as it helps them in monitoring their infants. These factors and increasing benefits of wearable devices are thereby exaggerating the growth of wearable sensors market across the globe. On the basis of type, the global wearable sensors market is segmented into medical based sensors, image sensors, motion sensors, pressure sensors, position sensors, inertial sensors and others. Among different types of wearable sensors, motion sensors hold the largest share in the wearable sensors market, globally. The category is expected to witness a CAGR of 33.1% during the forecast period, since it is helping the business enterprises in generating enhanced output and provide extensive precision while monitoring and tracking activities of users. Moreover, the capability of this sensor that helps in distinguishing whether the user is shaking the wrist or taking steps is the major factor contributing towards the overall growth of the wearable sensors market, globally. On the basis of application, the global wearable sensors market is segmented into wristwear, eyewear, footwear, neckwear, bodywear, and others. Among all the applications, body wears are expected to witness significant growth in demand for wearable sensors during the forecast period since this segment is observing wider application among various industry domains such as healthcare, electronics and industrial. Bodywear comprises of a textile that is entrenched with sensors that is the key trend observed in the growth of global wearable sensors market. Furthermore, body wears comprises of technology-driven fashionable clothing that fetches sensors close to the skin of the human body that further helps in assessing numerous fitness and health factors. Based on end-user, the wearable sensors market is segmented industrial, consumer, healthcare and others. Among all these segments, consumer segment is expected to witness the highest CAGR during the forecast period due to increasing demand for sensor-fused systems that is attributed towards extensive accessibility and awareness regarding remote observation of fitness and wellness. Furthermore, increasing demand of consumers pertaining to VR headsets, wrist-worn and smart clothing along with excessive emphasis from business providers to provide optimal and innovative elucidations to users are thereby strengthening the growth of the wearable sensors market. Increasing utilization of smart glasses that help in creating appealing experience to the users is the key trend observed in the wearable sensors market. These glasses provide mixed reality understanding to the users and with key players such as Microsoft, Google and Intel evolving and enhancing glasses this market is expected to witness increasing demand of these products that can be purchased at affordable prices. Additionally, increasing requirement for data related to health and fitness that helps in understanding various health-related issues to the doctors is another key trend strengthening the growth of wearable sensors market worldwide. The major factor that is driving the growth of global wearable sensors market include extensive enlargement of internet of things (IoT) in various industry domains such as consumer electronics and healthcare. A number of fitness and health monitoring applications are gaining eminence across the world at a rapid pace. There are several manufacturers operating in wearable devices that have assimilated contextual material and data points that help in determining motion detecting happenings. Furthermore, the results and analysis developed from these devices further helps in establishing results used for defining fitness and goals to its users. Moreover, increasing expenditure of consumer in observing activities such as heart rate, fall detection, blood oxygen level and calorie count is another factor that is driving the growth of global wearable sensors market. High cost of wearable products along with stringent regulatory compliances are expected to hinder the growth of the wearable sensors market, globally. Furthermore, shortage of common standards and interoperability concerns is the major factor that is restraining the growth of global wearable sensors market. Globally industry players of global wearable sensors market are leveraging market growth through new product development, mergers & acquisitions, partnerships, increased investments and technological upgradation that is bolstering the market demand for image sensors market across the globe. 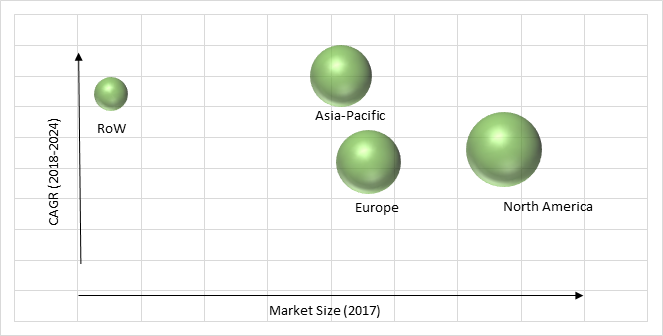 Geographically, wearable sensors market in Asia-Pacific is expected to witness the fastest growth during the forecast period since OEMs are creating considerable support towards the enlargement of IMUs (inertial measurement unit) and MEMS (micro electro mechanical systems) technology that is helping various business organizations in assigning lower prices to the newly developed products from them. Moreover, it has been observed that there are several key players in Japan and China that are extensively investing towards the development and advancement of sensors that are pertaining towards the increasing demand of health and fitness tracking systems. Moreover, wearable sensors market in North America generate the largest revenue and is anticipated to witness significant growth during the forecast period. The largest revenue of this region is accredited towards extensive adoption of digital technique among business enterprises in North America. Additionally, thriving healthcare domain in this region is accentuating the acceptance of wearable sensors products that is further contributing towards the growth of wearable sensors market in the near future. The market structure for global wearable sensors market is consolidated structure and the key players operating in the wearable sensors market include InvenSense, Inc., NXP Semiconductors, Panasonic Corporation, Robert Bosch GmbH, STMicroelectronics, Texas Instruments Incorporated, KIONIX, INC. (ROHM Co., Ltd.), Measurement Specialties, Inc., Analog Devices, Inc., ZOLL Medical Corporation (Asahi Kasei Corporation), Freescale Semiconductor, Inc. and Infineon Technologies AG. Table 147 Snapshot – Measurement Specialties, Inc.
Table 148 Snapshot – Analog Devices, Inc.
Table 150 Snapshot – Freescale Semiconductor, Inc.
Table 151 Snapshot – Infineon Technologies AG.